Just over eleven years ago, my wife and I rescued a fuzzy black and white bundle of joy. 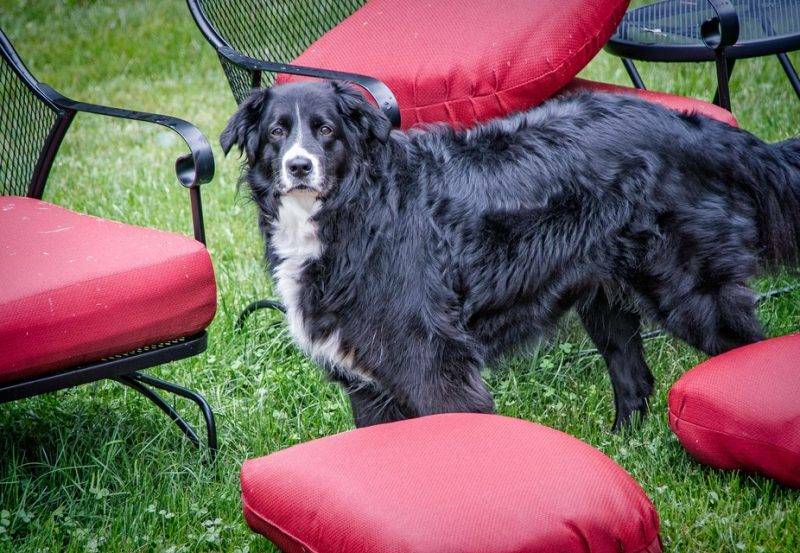 Roxy, our border collie / lab mix became our best friend, terrorizer of woodpeckers, herder of deer and black bear, and guardian of the home – and the best damn dog I’ve ever had the honor of having in my life… never owned, simply an part of our family. Today we had to put her to sleep, the hardest and only thing we could do to put an end to her pain and suffering. Over the time we had together, she helped me through the toughest times of my adult life. She was there when I’ve been in and out of hospital, when my father was ill and passed away, and others more numerous to count. She was always right there laying down looking at me to rub her belly; licking my hand or face, washing away all the problems in the world – if only for a little while. Today it was my turn to be there for her, regardless of how much it broke my heart to do so. Those who were lucky enough have had such a dog in their life will understand. She wasn’t always the easiest for strangers to get close to but never mean, just protective – especially of Jen and Raven. She was a family dog from wet nose to fluffy tail, but once she warmed up to you and accepted you into the family and “her pack”, you were going to be lavished with kisses and her requirements for the recommended daily allowance for belly rubbing and paw holding. I remember the day we rescued her from the hell-hole of a pet store Jen found her litter at. Jen had called me at work, she had found a litter of border collie mixes. We arrived, played with a couple, but this one who we later named Roxy (she chewed rocks and cement like no tomorrow as a puppy) picked me (even though I like to pretend I picked her). Weeks later I remember running home with her tucked under my arm like a football when some stray/wild dogs chased trying to attack her, crying and yelping the whole way, then crawling into my lap licking my face once we got home. When she was a puppy, she would nip at the heels of our daughter – trying to herd her. The screams of “Ow! Quit it!” echoing throughout the house made us all laugh so damn hard and Raven’s pre-teen indignation. We will forever hear her barking from a window or door at every deer, bear, turkey or other trespasser, letting them know they are in the wrong place – herding instincts showing themselves in spades. Hanging out in the living room with a roaring fire and her sitting on her throne chair keeping watch on everyone, or just licking beer from my fingers. The worst days were made better just by her presence, and the best days are ones we spent with her regardless of where we were. Before I left for New Zealand, Roxy was diagnosed with cancer which spread all to aggressively while I was away. There was nothing left we could do for her other than to not let her suffer anymore. My wife and our vet made sure that she would be here for me when I got back from my trip, thank you Dr. Sherry and everyone else at Homestead Veterinary! While it may be selfish, I can’t express how much it meant to me for the ability to share some time with her, and say goodbye to her. Home is where the heart is, and now there is a huge gaping hole in our home and hearts. Whether you call them pets or furkids, they are family, and a gift that never lasts long enough, yet lasts forever all at the same time. Today we are sad and grieving, but you will always make me smile inside … my furry goofball. Roxy girl, we will always remember you and the joy you brought to our family and home… and miss you terribly. My only consolation is that you are no longer suffering … rest now girl, your long watch is over. This entry was posted in Dogs, Personal and tagged 2017, dogs, family, furkids, mourning, roxy.